The RULES COMPANION changed this up a bit (and also changed the Stun Rules). Now, you can get hit, and the hit will have no effect on you--not even stun you. Stun Damage, under the Rules Companion, has its own chart which is a bit different than below. 2 x Damage Roll < STR Roll = NO EFFECT. A 1 STUN means -1D to all actions. A 2 STUN means -2D to all actions. And, these stack. If you get hit three times in a single combat round, taking 1 STUN, 2 STUN, and 1 STUN from all three attacks, then you are heavily stunned with -4D to all actions. Damage occurs whenever Damage Roll is greater than or equal to STR roll. This is scaled, based on how much the Damage Roll was over the STR roll. 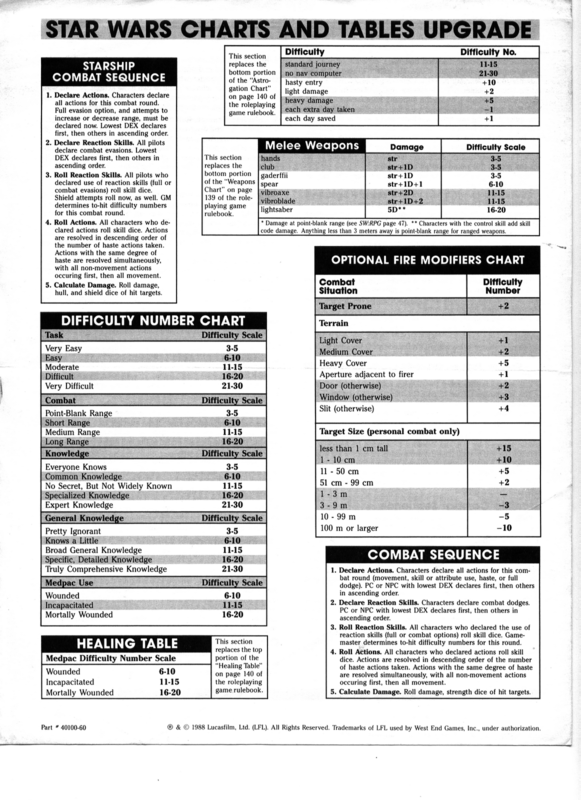 Second Edition Revised & Expanded used the same chart, but it added a new wound level called Wounded Twice. In this edition of the rules, a character that was already Wounded, and then Wounded again, did not go straight to being Incapacitated. Instead, this character became Wounded Twice with -2D to all actions. 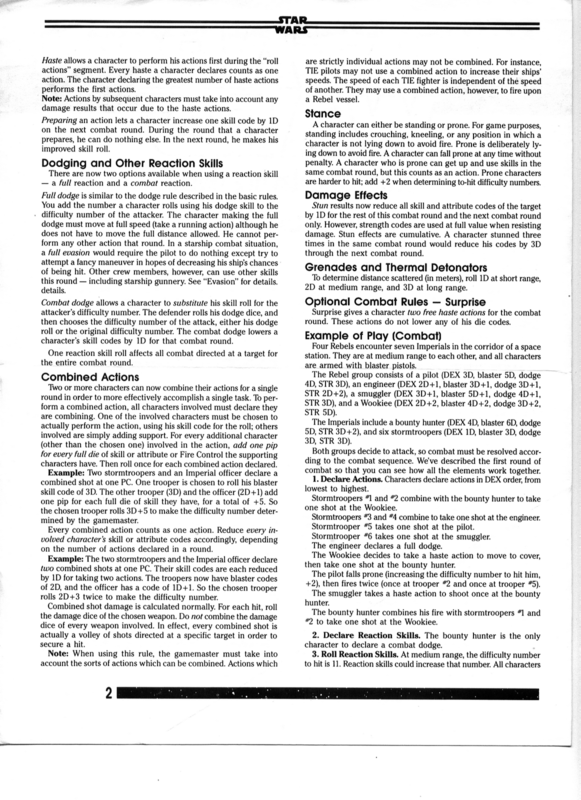 The Rules Upgrade was the first "revision" of the First Edition rules. "Revision" is a too strong a word, as the Rules Upgrade is only four pages with one of those pages dedicated to new charts. It was provided for free by writing to WEG, and it appeared packed with almost all WEG D6 First Edition Star Wars products. Still, it is the first attempt to alter the rules provided in the core rulebook (besides the slight errata for the book provided by WEG). Skill points are awarded at the end of an adventure or periodically during a campaign. The rules specifically state that a player doesn't have to spend all of his character's skill points as soon as they are awarded. Skill points can be saved and applied after any night's game session. What I used to do is allow players to use skill points anytime that they wanted (of course, after the points were spent, there was no going back). If the player wanted to improve his Blaster skill with the spare points he has on hand just before the character goes into (or even during) a Blaster fight, then why not? Why make the players wait until the end of the session? I say to allow the players to improve their characters at any time they want. A bonus to doing skill improvement this way is that skills will be spent where the character really needs them and not where the player thinks the character should put them. There's a difference. If the character is piloting a modified tramp freighter and has three TIE fighters on his tale, the player may decide that right then is a good time to improve his character's Starship Piloting skill. The character needs that skill right then. It is important to the game. If you wait until the end of the session, the player may decide to just improve his Blaster skill. Which is fine. The player can spend the points any way he wants. But, it's more "in flow" with the game if the player spends skill points on skills that the character really needs. Suppose, in the game, that it is paramount to convince a local crime lord to loan the PCs enough credits so that they can get their own ship. In order to have the best chance at bargaining, the player decides, right then, to improve his character's Bargain skill. 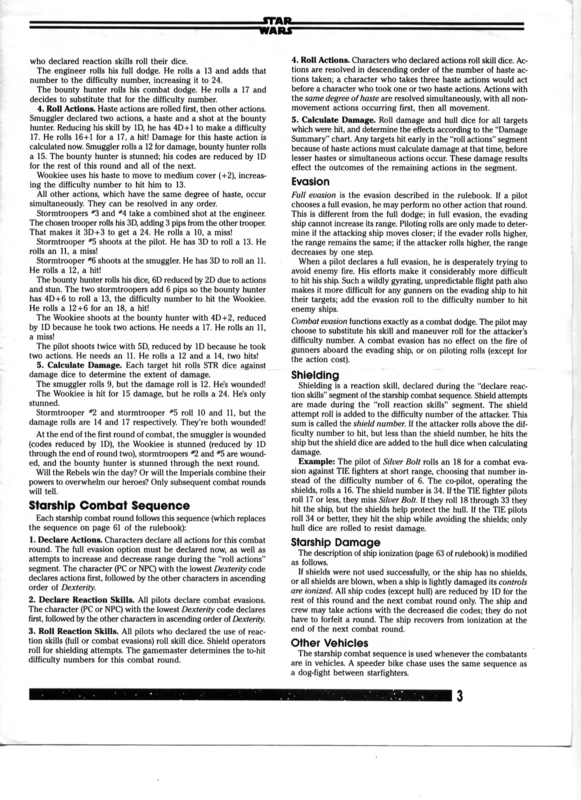 Had we waited until after the game session, the necessity of the Bargain skill improvement may not seem as important to the player, and, again, the player improves the character's Dodge skill instead. Allowing players to spend skill points during the game session also provides another little heroic benefit to the PCs. The player can boost up (to the limit of his skill points) any skill that he might need for an upcoming encounter. If a character doesn't have the Brawling skill, and he's about to fight a Wookiee in hand-to-hand combat (good luck! ), the player can improve the character's odds of surviving right then by spending skill points. It's on the sheet. It's easy to do. First Edition doesn't use Character Points. So, I say, "Why Not?" I can't think of a good reason not to allow it. First Edition Star Wars is not about counting squares for range and figuring exact distances. It's about wham-bam-thank-you-ma'am, swashbuckling, space opera action. Zoom-zoom! The very first section of the combat chapter gives you some very good pointers for running combat. Despite the fact that different weapons in this game have differing ranges. A target at 10 meters is at Long Range for a Hold-Out Blaster, Short Range for a standard Blaster, and at Medium Range for a Heavy Blaster Pistol like the one Han Solo uses. Now, you can play the game as is done with many rpgs and count out exact ranges. Or, you can just let the action fly! Target is very close, say 3 meters or less? Point Blank Range 5+. Combat takes place indoors? Short Range 10+. Combat takes place outdoors? Medium Range 15+. At Long Range 20+, this is typically reserved for sniping. So that's it. If you're indoors, then use Short Range for everybody and be done with it. If outdoors, make range Medium for everybody. Boom and zoom. Keep the bolts flying. Now, once you've gotten comfortable with the standard weapon ranges provided in the core rulebook, you, as GM, can be a little more picky about estimating ranges. For example, short range for a stormtrooper's blaster rifle is 30 meters or less. If you're outdoors, and the PCs are using blaster pistols against the troopers, then rule that the PCs are at Medium Range, as noted above, but the troopers are at Short Range due to the farther range specs on their rifles. Just keep it easy and fun. By the way, one of the new Marvel comics series features Chewbacca. It's a delightful yarn. I loved it. If you like Chewbacca, you should run out and get this before it becomes hard to find. I thought the Lando book was damn good. Chewbacca's solo book is super-duper-fantastic! But, why do I bring that up here? The book features a character--a little girl. I'd say she's about 12 or 13. She's a bit of a tomboy. And, she won't stop talking. And...her dad has been rookie-doo'ed by a local crime lord. And, she needs some help. This little girl will steal your heart. Especially, if you've got kids of your own. If you ever wanted a perfect example of the Kid Template from the 1E Star Wars D6 Core Rulebook, then this is it! Read this book, and that dangerous Boba Fett bounty hunter type that you were thinking about playing might have some competition! Picture Tasslehoff Burrfoot, but in the Star Wars universe, and as a human girl pre-teen, and you've got the idea. This would be magic in the hands of the right roleplayer. First Edition presents one of the easiest space combat systems I've every seen. You can also adapt the system to foot chases or vehicle chases very easily. 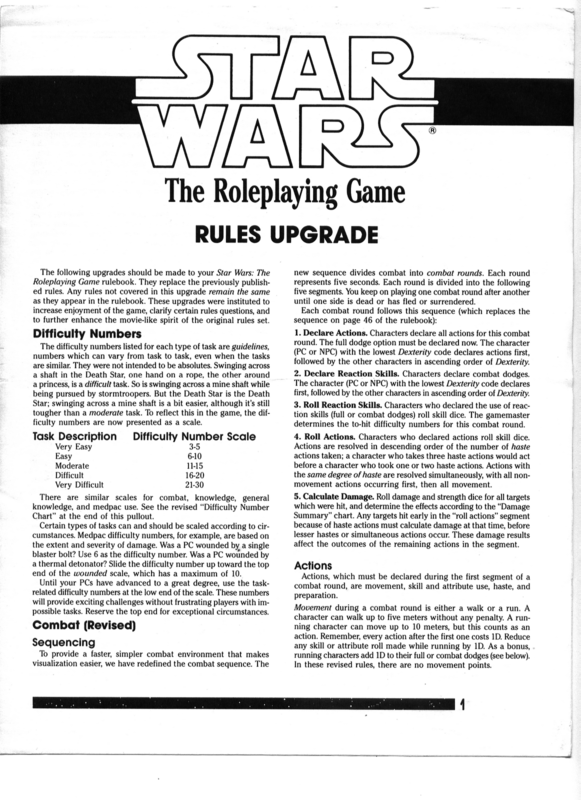 The Star Wars RPG divides the game into scenes and rounds. "Scenes" are roleplaying scenes--any time played outside of combat rounds, played with the casual back-n-forth between players and GM. "Rounds" refer to actual combat rounds where things are a little more regimented. Space combat uses three abstract range categories: Short, Medium, and Long. Anything at a range beyond long is considered "scene" territory. You'll just roleplay what happens between vessels out that far. Combat can, but doesn't have to, start at any of the three abstract ranges. If a TIE fighter is approaching the PC's ship, then combat starts at Long Range. If the GM roleplayed a scene where an Imperial Customs Frigate came alongside the PC's craft and began boarding procedures, and the players, at that point, decided to let the enemy have it, with their characters opening up with the Quad Laser Cannons, then combat begins at Short Range. The combat round is akin to the personal combat round. At the beginning of the round, the combatants state what they are attempting to do. Then, the GM flys from segment to segment, rolling dice when needed, playing out the moments in a fashion similar to watching quick cuts of an action scene in a Star Wars movie. SPEED FIRST! The first thing that will be decided in a Star Wars Starship Combat Round is what range will be used for the combat that round. If both enemy and the PC's ship are moving towards each other, then decrease the range by on level. Long Range would become Medium Range. If both the PC and the NPCs are moving away from each other, then automatically increase range by one level. Medium Range would become Long Range. Long Range would move out to beyond long range, and the combat would be over. If one ship is trying to increase range, and the other is trying to decrease range, then a Chase situation is at hand. We roll dice. Each ship rolls its Speed Code. The ship that rolls highest decides range for the round. Pilots can add their Starship Piloting rolls to the Speed Roll, but it counts as an action for the round (meaning that, if the Pilot does anything else in the round, skill codes are reduced normally). Once Speed is decided, the range used for the combat round will be know by all combatants. You've got a TIE fighter coming in, point three-seven. RIGHT, I'll jump into one of the quad-pods and try to take him out. The TIE wins the Speed check, and range for this combat round will be Medium. Gunnery checks are successful on rolls of 15+. You slam the Century Eagle into a 90 degree, hard dive. The ship spins like a corkscrew towards the planet's surface. The TIE, though, has you locked in. It comes screaming in, slightly tilted, green fire erupting from it's twin laser cannons. Torack clicks in over the comm, "I see 'em. I see 'em. Steady. Steady. Now!" And, he rolls dice to see if he hits the TIE. The rest of the round is played out in segments--one segment per attack. In the case of two ship firing at each other, as is happening in the example above, do as you would in personal combat. Both ships fire, and the highest attack roll is decided first. Pilots/Shield Operators Can do two things during these combat rounds, and both actions are considered "reaction skills". EVASION - A pilot can roll his skill dice, then rolls the ship's Maneuverability code, and adds both to the difficulty of the shot for any enemy attacking the ship this segment. One pilot check like this raises the difficulty number to attack the ship for every incoming attack during the entire segment. A spinning vessel moving at Star Wars speeds at close to 90 degree angles is hard for everyone firing at it to hit. Evasion can be attempted once per segment. Evasion is akin to Dodge for vehicles. It adds to the enemy's difficulty to hit you. EVASION = Pilot Code + Maneuver Code, then add total to enemy target number. SHIELDS - Another thing that can be done to protect the ship is to angle a deflector shield. Unlike Evasion, a separate Shields check must be made per shot fired at the ship during the round. To use the shields, a character must make a Shields skill check. The difficulty of the check is based on the range to the attacker. If successful, the ship's Shield Code can be added to the Ship's Hull code when rolling for Damage against the ship. Starship Shields is a Reaction skill, so it doesn't need to be declared. But, of course, the multiple action penalty applies to anyone trying to make multiple shield rolls or other actions in a combat round. Shields can be attempted once per incoming shot.Therefore, it can be used multiple times during a segment. DAMAGE - When a ship is hit, the weapon's damage is compared to the ship's Hull Code (similar to weapon damage compared to STR rolls in person combat). If a successful Shield check was made, then the ship's Shield code is added to the Hull code for damage determination. There are multiple phases to a combat round. The Piloting Segment is where the players announce their character's actions for the round. The Speed Segment is where Speed Codes are matched to determine range for the round. The Fire Segments are where Gunners try to hit their targets, Pilot can attempt to Evade incoming fire, and Shield rolls are made when character attempt to angle deflector shields against incoming fire. Damage is also rolled in this segment. Let's go through the steps of a simple scenario where the Millennium Falcon is chasing a TIE fighter. Pilot Segment: The GM describes the situation, stating that the two ships are a Medium Range. Han will pilot the Falcon, trying to decrease range. Chewie is in one of the Falcon's gun turrets. The TIE pilot will try one action: increase range. Speed Segment: The Falcon's Speed Code is 4D. Han can add his Starship Piloting skill to this throw, but if he does, it will count as an action, lowering his codes later if he needs to use Shields, perform maneuvers, or avoid obstacles. Han decides not to add his Piloting. The TIE has a Speed Code 5D. The TIE does not add his Pilot skill either. Han rolls a 9. The TIE rolls 11. Now, the two ships are at Long Range. First Fire Segment: Chewie fires at the TIE. His Gunnery skill is 4D+1, and the Falcon's Fire Control is 3D. Which means Chewie will throw 7D+1 on this attack. The TIE will use a Reaction skill here and add his Piloting skill of 2D and the TIE's Maneuver Code of 2D to Chewie's difficulty. The TIE rolls a total of 13. Chewie's target number is 33. That's 20 for Long Range plus 13 for the TIE Evasion. Chewie rolls and misses. And, that's the end of this round as we've completed all declared actions. -- In the Speed Segment, Pilots must decide whether they will use their Pilot skills or just rely on the ship's Speed Code. Using Pilot skill counts as a skill use, and later actions in the round will suffer the multiple action penalty. -- Evasion is a Reaction skill that works like Dodge. Pilots roll their skill and add that to enemy target numbers. -- Shields are rolled as Reaction skills. To angle a deflector, roll the Shields skill against a target number for range to the enemy. -- If successful on a Shields roll, the ship's Shield code is added (like armor) to the Hull Code when rolling damage for a successful hit. -- Resolve any special maneuvers in the Speed segment. These characters have a lot to do. On larger ships, piloting, shields, and gunnery can be performed by separate characters. In a one-seat fighter, there's only one person* to do all the jobs. Because of the multiple action rule, it is sometimes not possible to do everything in one round. A pilot who used his pilot code for the Speed segment and for Evasion may not be able to also use the Shields in the same round. Players must decide which functions are most important that round--where their characters will focus their attention. *Don't forget to utilize droids! If in an X-Wing, for example, the R2 unit can share duties with the pilot character and perform, sometimes, better than the pilot will. Delete me too! Me! Me! I had read this posts at Dragonsfoot, and they were the ones that convinced me to go 1E instead of 2E. This information is awesome Wajeb! And it's cool to now get it here, all in one place. Big thanks! Wow, Wajeb. Thanks for beefing up our 1e section here! I didn't read it all, but one thing I noticed in my overview is the use of 2e skills with the 2e template. There is no space transports in 1e. It's starship piloting. I know that doesn't change the way the game works, but I just thought I would mention it for anyone reading this. Really enjoyed the 1E write ups. I'm toying with switching to 1E when I restart running Star Wars. If you like Chewbacca, you should run out and get this before it becomes hard to find. I thought the Lando book was d*mn good. Chewbacca's solo book is super-duper-fantastic! Thanks for the tip I'll have to keep an eye out for the comic. Of course I had to look up Tasslehoff Burrfoot. I had no idea who that was. SHIELDS - Another thing that can be done to protect the ship is to angle a deflector shield. Unlike Evasion, a separate Shields check must be made per shot fired at the ship during the round. When this check is made, a character rolls his Shields skill and adds that to the roll for the ship's Shield's Code, and this total is added to the difficulty for the enemy shot. If the pilot evades that segment and the shield person angles the shields against a shot are those additive for that one shot or is it the best of the two? round and the next combat round. Stun damage is cumulative. all actions for the rest of round seven. Does anyone know the reason for that rules change? To me it seems that the standard 1E rule is extremely punishing. Losing all your actions for getting hit seems quite harsh. Any thoughts? Note that if a player wants to use a Force power that he doesn't have, then the character must learn it. Ins't that optional? According to the 1E book: "A character who knows a Force skill can use any or all of the powers listed under the skill name". Yeah, I couldn't find a 1E Template on the net to set as a picture in the post. If you have one, please change it out. Good thing to point out, though. Does anyone know the reason for that rules change? I'm guessing the author of Classic Adventures looked at the various methods used in the various D6 editions and picked the one that he liked the best. To me it seems that the standard 1E rule is extremely punishing. Losing all your actions for getting hit seems quite harsh. Any thoughts? A combat round is five second long. Blasters are extremely powerful. Look at the new movie, TFA, especially. When people get hit, the are often times knocked off their feet and go sprawling. A blaster bolt is tibanna gas heated to a plasma state. Blasters are plasma pistols. That super-heated gas packs a hell of a punch, so even a graze should jar you quite a bit. I don't think a 5 second jolt to the system, where you try to collect your whits and ensure that your arm really hasn't been blown off (if just feels like it does), is too harsh. I think it's about right. You've been knocked to the ground. You may have dropped or tossed anything you were holding. And, a part of you really hurts. In Return of the Jedi, outside of the Imperial Control Station, Leia gets a very slight graze. Even with that, she's down for over 5 seconds--over a combat round.